Sew Useful Designs: A blogger must take her camera everywhere! 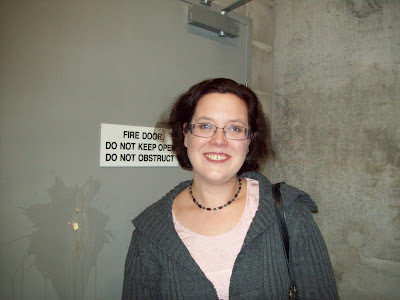 When I first started writing a blog, my very dear and blog-tastic friend Kerryanne, gave me some great advice. She said, "Take your camera with you wherever you go!" So I dutifully pack my camera into my bag whenever I go out - and last night was no exception - as I was off to an exhibition with my enthusiastic "felting friend", Narelle! 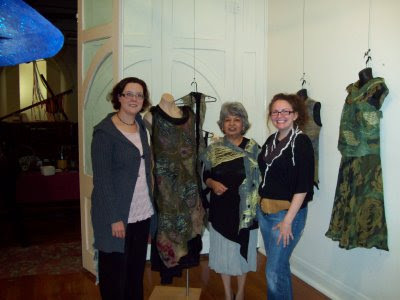 The exhibition, aptly named "Felt like it" featured wearable art by the gorgeous and flamboyant Rita Caspersz. Here we are pictured among some of Rita's creations. Narelle is to Rita's left and I am far right. I am sorry about the poor lighting in this shot as you can't see the full beauty of Rita's garments. 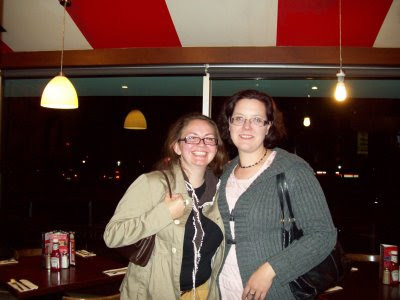 Anyhow, Narelle and I decided to make a night of it and go to a restaurant after the event, so off we headed to the nearest TGI Fridays... we parked the car on the upper car-park level... and tried to find the exit! Yep - we entered alright - but do you think we could get OUT?!!! We find ourselves at the bottom of the stairwell, surrounded by broken eggs and their stale splattered contents... and can not open the fire EXIT door! So we trot back up the stairs again to get out from whence we came...but the one thing with fire doors (as Ral and I have discovered) is that once they are closed behind you, they do not open again! I'm sure that the local Fire Brigade would have been alerted simply by the velocity of our laughter, as we couldn't quite believe how we had gotten ourselves into this predicament! So Ral has the brainwave to call TGI Fridays, and the manager endeavours to come to our rescue. While we wait, Ral has another go at opening the door - this time using her foot instead of her hands - and Wah-La! We are free girls again!!! It was a bit embarrassing walking into the restaurant as it seemed that every staff member knew we were the ditzies stuck in the fire escape! But we lived to tell another tale... and the camera proved its use again! I'll refrain from putting up pics of all the broken eggs I saw, as from the amount of images on my camera it would seem I was rather taken with them! This is Ral and I just before we left the restaurant to drive home... we had such a good laugh.... and if you're wondering... No, Omelet was not on the menu!! Of course, I am not laughing at you [insert sneaky snickering here], just laughing along with you. Laughing is all you can do in these situations and I bet the staff were having a hoot at your expense...hee hee. It is so good to laugh at ourselves . Glad you had fun anyway. What a hoot! Experience something new everyday they reckon , well I think you took a weeks experiences with your laughter. How wonderful, the adrenaline would be rushing. Oh Vikki I love your sense of humour :) I cant think why there would be eggs all over the place tho...how strange?? Glad you got out and had a good night after all.